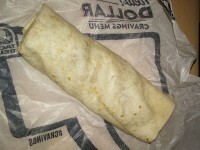 Last week I reviewed the Taco Bell Cheesy Bean and Rice Burrito, which was fantastic. Just thinking about it make me want to head over and grab a couple for my 4th meal. Next up from Taco Bell is another offering from their Dollar Cravings menu: The Shredded Chicken Mini Quesadilla. I did like how they wrapped it in tinfoil to keep the heat in, but once it was unwrapped, disappointment set in. The edges of the tortilla were soggy due to the sauce. The chicken was moderately spicy, but there really wasn’t much of it. Seriously, the quesadilla was almost empty. The chicken did taste nice and was seasoned well. 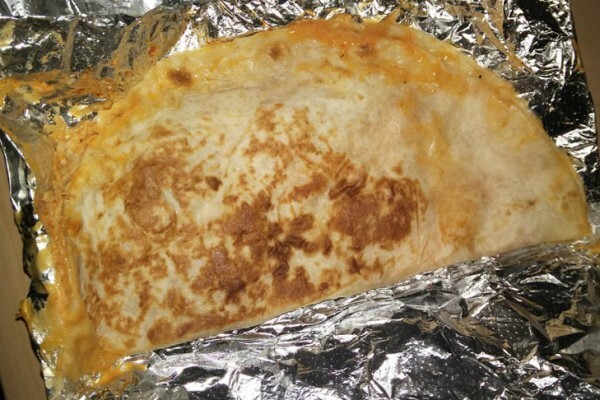 I would have preferred maybe some extra cheese, or just something else to bulk up the quesadilla. According to Taco Bell’s website, this was supposed to have a “three cheese blend.” I must have missed it cause there wasn’t much cheese inside. The chipotle sauce was okay, but caused the tortilla to soften. Hunger Filling Grade: C – There just wasn’t much here. There are way more filling items on the Dollar Cravings Menu that will fill you up for the same price. 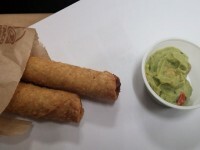 Value Grade: C – This is a small step above the “cheesy roll-up” from the same dollar menu that I won’t bother reviewing. The whole thing is too small, and doesn’t make up in taste. 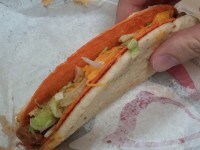 Bottomline – Taco Bell rarely disappoints me, but this just wasn’t up to the standard I expect from them. Save your dollar, or bring some extra dollars because you’ll need to order some extra items to fill you up.